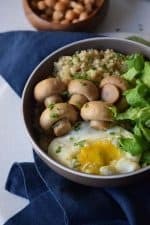 And can we please talk about the fact that this Savory Quinoa Breakfast Bowl is just as good for dinner as it is for breakfast? Maybe it’s because I’m the type of person that really likes savory breakfasts, but seriously this works for both meals just as good. I believe that part of the secret is the poached egg on top. It helps to pull the Savory Quinoa Breakfast Bowl together. But for me, the real star of this recipe is not the quinoa nor the poached egg nor the lettuce. Nope. The real stars are the sautéed mushrooms! Mushrooms are one of the most versatile ingredients you can use; they are super quick to cook, you can use it as buns for a burger, you can cut them small and use as a filling for pot pies or omelets, and you can slice them to use on top of pizzas, or on pasta sauces, or for pretty much everything you can think of. They are also a great meat substitute if you are vegetarian. I like to sauté the mushrooms real quick to make sure they keep almost all of their texture. If you cook them for too long, they end up being a watery mess that’s too soft for the bowl. However, if you give them a quick cook in a saucepan with a bit of olive oil or coconut oil, some spices and just a pinch of sea salt – they end up perfect! This is my new favorite Clean Eating breakfast! 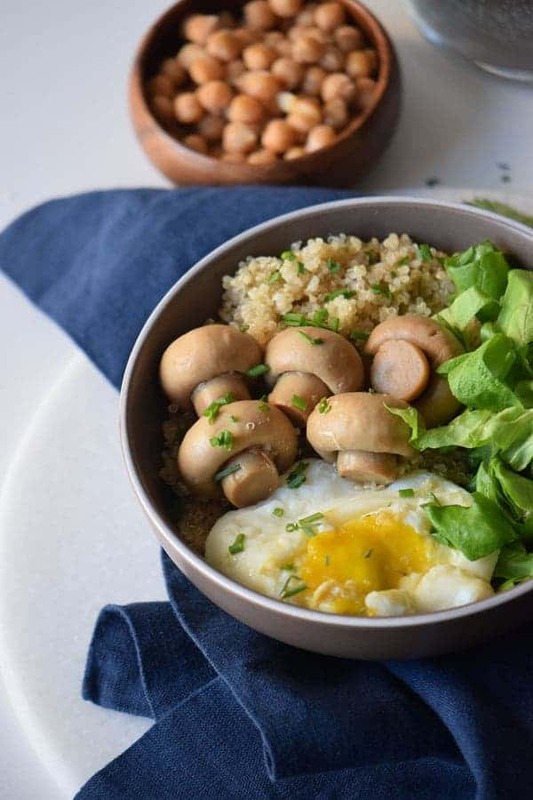 I use leftover quinoa and just sauté some mushrooms, poach an egg, add some greens and I have a satisfying, delicious breakfast I don’t get tired of. Place the mushrooms in a saucepan over medium heat. Add the olive oil, ground pepper, minced garlic, and salt and sautee the for 2-3 minutes. Boil the water in a small pot, and cook the egg over low heat for 3 minutes. Fill the bowls with lettuce, quinoa, poached egg, and mushrooms. I’m going to try this sometime. I cook a big batch of quinoa ahead of time in my instant pot and keep it in my frig. Then I just heat up the amount I need when I make something. That’s what I’m going to do with this. It will be a real quick breakfast if I do it that way.